documentary: "Phasors Built My Hot Rod"
2004/12/16 ::: New! There is a new version of the "Phasors Built my Hot Rod" DVD out, with a new version of the title documentary and bonus performance footage! 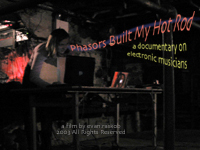 "Phasors Built My Hot Rod" is a documentary exploring current issues involved with designing, building and performing new musical instruments. The original, full-length documentary is available here, in a low-resolution format. It is divided into seven successive sections, making it easier to download. Please email me at nime @ lowfrequency.org for permission to show this version, or with any questions or comments. Questions and comments would be appreciated! The new, full-size version is on DVD, with extras including performance footage. There are also 10 limited-edition DVDs available, hand-designed and hand-decorated. To get one, please make a donation of $8 (or more??) to my NIME2 Doc fund via paypal from the form below. Otherwise, regular ol' DVDs are also available. Just send me your mailing address. Donations for those are also accepted (it costs me about $2-3 per DVD shipped), but not necessary! Donations help pay for the cost of the DVDs, software, cameras and equipment, blank tapes, and miscellaneous computer hardware used in the making of this film. Donations also go towards funding new NIME2 events. This work is copyright Evan Raskob 2003, all rights reserved. Here are some excerpts from my journal, written while I was creating the concept and filming the documentary. Not as interesting as the documentary itself, me thinks. The kid gets in the picture.